The Jambeli Rescue Foundation has developed a successful captive breeding program for the Great Green Macaw over a 10 year period. One of the principal objectives of this program is the release of adult GGM´s in its dry tropical forest habitat and contribute to the conservation program for the species in its natural state. The Pro-Forest Foundation has more than twenty years experience in the development of programs and projects benefitting the conservation of the dry tropical forest ecosystem, especially the Cerro Blanco Protected Forest, which has been used by Great Green Macaws as nesting, roosting and feeding sites. 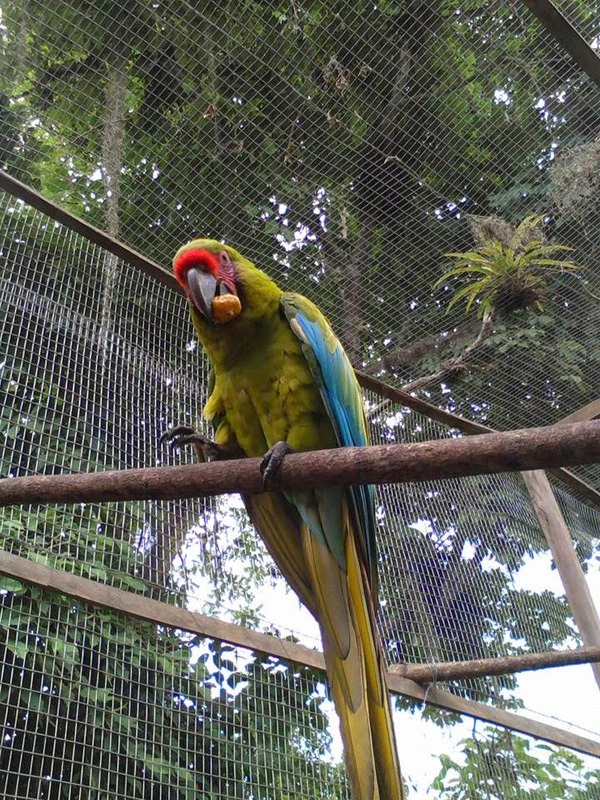 The Pro-Forest Foundation has carried out several programs and projects that benefit directly the Great Green Macaw in the Cerro Blanco Protected Forest and adjacent areas including protection of nest sites and habitat through park ranger patrols and law enforcement, habitat restoration and enhancement through the construction and placement of artificial nest boxes as well as environmental education and awareness building in local communities both for adults through an honorary park warden project as well as primary and secondary school programs. The Jambeli Rescue Foundation and Pro-Forest Foundation have joined with other organizations in Ecuador to prepare and implement a Great Green Macaw National Conservation Strategy beginning in 2003 to the present. The strategy includes a ex-situ component which includes the reproduction and eventual release of Great Green Macaws to help bolster the wild population in Ecuador, which is critically endangered. In March we had to Will and Sophy as volunteers in Cerro Blanco, they from England. Them project was to record photos and videos about adaptation's project. The photos and video presented here are the result of his outstanding work. 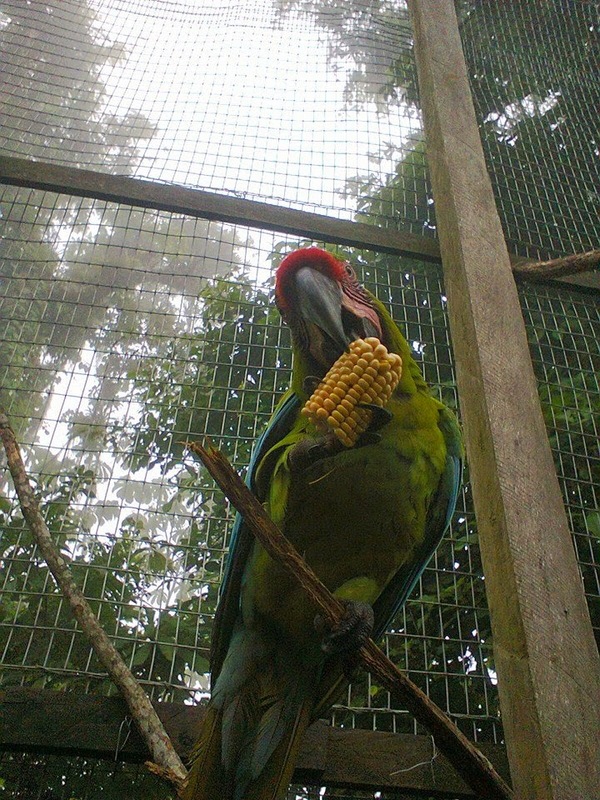 Here also are some pictures taken by the ranger in charge of the care and feeding of parrots Mr. Armando Manzaba. 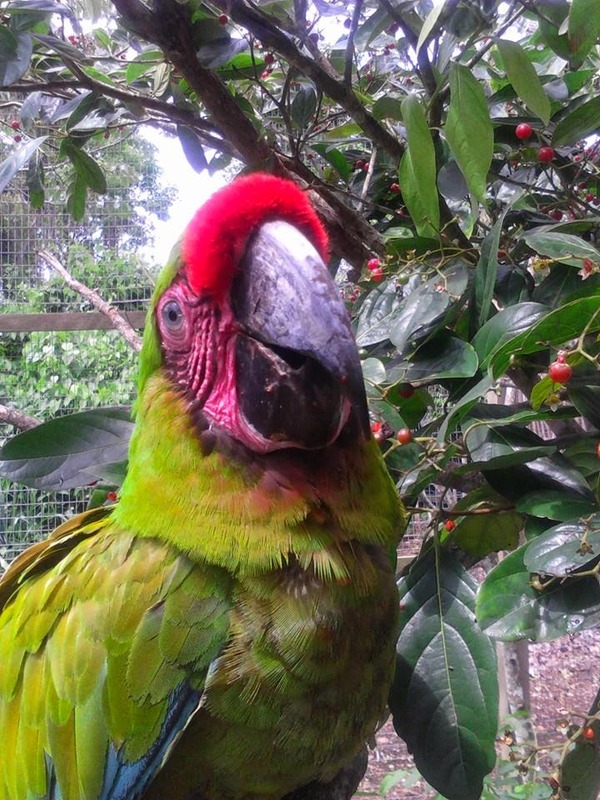 In 2012 the World Parrot Trust made the first project donation. October, 2012 construction began on the flight aviary. 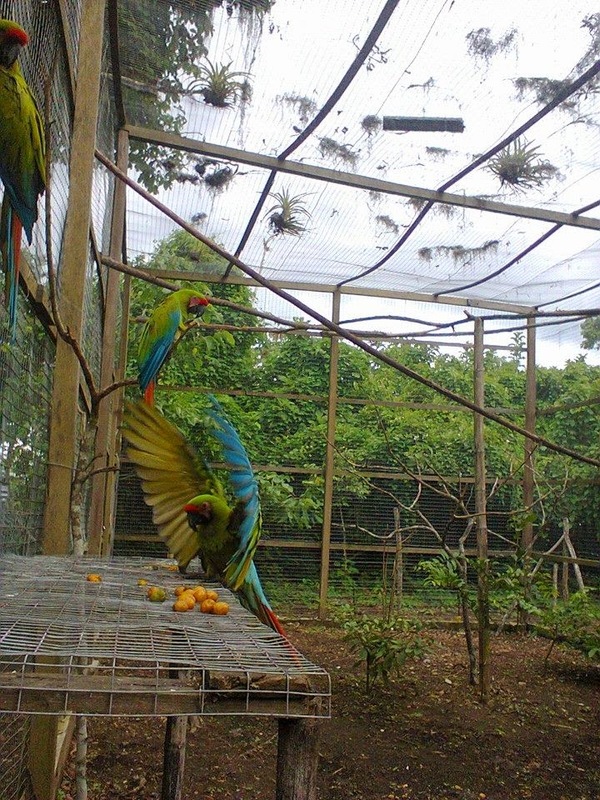 January 4, 2013 seven individual macaws were transported from the Jambeli Rescue Foundation to the future flight aviary. February 8, 2013 one of the macaws died from a bacterial infection. 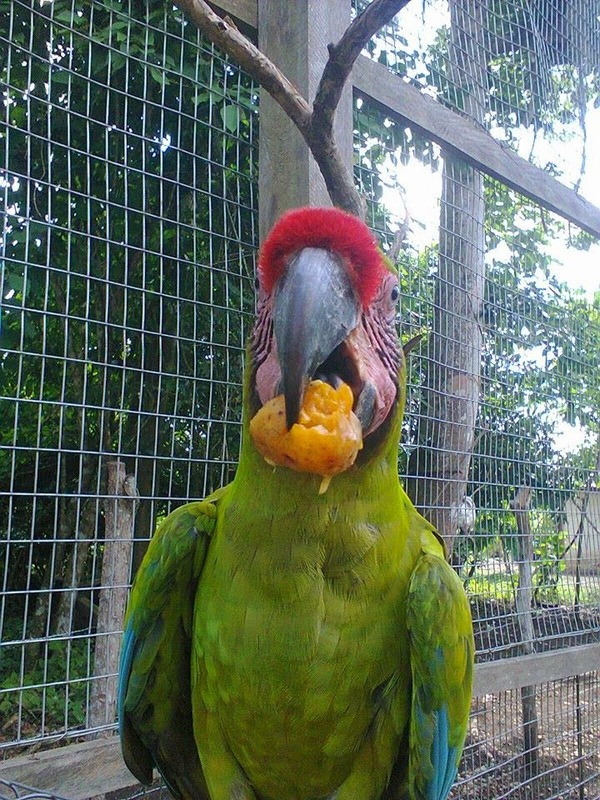 August, 2013, seeds and fruits of native dry tropical forest tree species began to be incorporated into the macaw´s diet. At first they were not accepted. At the same time, the provision of other foods was reduced. January, 2014 a milestone was achieved when the six GGM´s began to open and feed on the seeds of Amarillo (Centrolobium paraense) one of the macaw´s main food sources in the wild. February, 2014 other wild foods have been accepted, including fruits of Tutumbo Rojo (Cordia eriostigma) and other species, which indicates that the macaws are ready for a soft release into their natural habitat before the end of the rainy season, when the production of potential foods is at its peak.